Goodness! What’s been going on at the Climate Council? Any charity living off appeals to the public for cash, needs to show a bit of transparency, but I mostly drew a blank from the council when I asked them about matters 1 to 10 below. 1. Why was Chief Councillor Tim Flannery beseeching the public last June 29 to make “urgent” donations to the council, when the council was sitting on a fat $1.24m surplus after a $2.12m avalanche of crowd-funded donations in the previous nine months? 2. Why did Flannery, on March 12, 2014, resign as director from the beloved council he founded, along with his bestie and director Will Steffen, climate catastrophist at the Australian National University? 3. Why can’t I find any public announcement at the time from the Council about those resignations? 4. Why were those dramatic resignations not even mentioned for public consumption in the council’s 2013-14 annual report? 5. Why is the council so cagey about what it pays its CEO Amanda McKenzie? You can find out what a university vice-chancellor earns; you can find out what the head of a Big Four bank earns; you can even find out what Tim Costello, boss of the World Vision Australia charity earns ( $277,000 plus superannuation and long service. His total remuneration in 2013 was $316,000). But you’re not in the race to know what Ms McKenzie takes home from the pile of money that fans donate to the council. 6. Over at World Vision, CEO Tim Costello donates to World Vision all his earnings from speech-making, which can be as much as $150,000 a year. What’s the Climate Council policy on such side-earnings by Tim– up to $50K a speech, according to the Daily Telegraph — and his councillors? 7. What are we council donors paying Tim and Will Steffen these days, and for that matter, councilors Lesley Hughes, Veena Sahajwalla, and Andrew Stock? 8. Dr Flannery took up what seems to be a full-time Professorial Fellow position with the Melbourne University Sustainable Society Institute in October, 2014. Has this new role scaled back his work and pay as Chief Climate Councillor? 9. Given the council’s dedication to scientific rigor, could CEO Amanda give us an update on her forecast in 2008 that the Arctic will be summer-ice free in 2013? When I checked with the US National Snow & Ice Data Centre, the Arctic seemed to have 5.44 million square km of summer ice last September 1. Amanda should be keen to clear up any confusion about this. 10. How many all-powerful “Members” (as per Constitution) does the council have, and who are they? “The Climate Council operates in accordance with all obligations under the Australian Charities and Not-for-Profits Act and the Climate Council constitution. 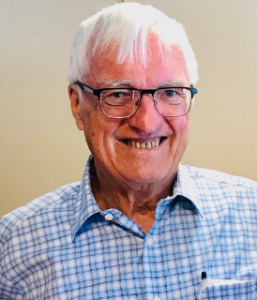 “Dear Tony, I wanted to write to say – thank you.Your donation today is powering Climate Council to cumulatively reach hundreds of millions of Australians with vital information on climate change, changing hearts and minds on this important issue. If you can share the fact that you have taken action and donated today it’s likely to inspire others to join you. We are only as strong as you make us.” Amanda McKenzie,Climate Council CEO, 10/4/15. (Amanda’s emphasis). Nice as Amanda’s letter was, it still left me to find most answers unaided. Question 1: Some background. Tim Flannery’s “urgent” appeal for donations, suggesting the council was facing some kind of crisis, began on June 29 and is still running. I suppose he would claim the “urgency” relates not to finance but to the council’s backs-to-the-wall propaganda fight against those “deniers” who are snickering at the 18-year halt to global atmospheric warming. So the “urgency” is just the usual flim-flam, or flim-Flan that all fund-raisers go in for. Question 2: Why did Flannery and Steffen resign as directors? Some background: The council is successor to the statutory Climate Commission of the Rudd/Gillard/Rudd governments, which were spending about $1.5m in taxpayer funds a year on the commission’s climate hysteria. The cost’s included Tim’s pay of $180,000 p.a. for three days work a week, equivalent to a $300,000 notional annual pay packet. Incoming PM Tony Abbott chopped the commission. The ex-members, led by Flannery and the commission’s ex-PR Amanda McKenzie, launched a brilliantly successful crowd-funding campaign ($1.1m in the first ten days) to recreate the commission as a charities-sector “Climate Council”. It would not be a good look for the ex-commissioners to be trousering the donations as personal salaries, so the policy announcement was that councilors would do their tasks voluntarily. Six months passed, and should we be surprised if councilors began to wonder why they were saving the planet pro bono, or as my spell-check is determined to write, “pro-bonobo”. Planet-saving is hard work when all is said and done. I imagine there was some animated discussion about it in the boardroom, since the PR aspects of dumping the voluntary code can be assumed to have been formidable. “8. Are the Councilors volunteers or do they get paid for their time? When the Climate Council was first set up, all Councilors committed to volunteer their time for six months, to ensure we could continue to produce authoritative, independent information about climate change following the abolition of the Climate Commission. Wow! Honorary work was a founding principle of the council! If from the outset the council had in mind that councilors might turn professional after six months, as per FAQ No 8, it’s odd that section 6.3 was written into the constitution itself, with Flannery/Steffen taking dual roles as director/councilors. So the pair had the choice: stay unpaid or resign as directors. Or maybe their resignations were coincidence – e.g. they both suddenly desired a better work-life balance? Anyway, I asked the council and it isn’t saying. The council appointed a quartet of new directors to keep up the numbers. The mega-wealthy Robert Purves, President of WWF Australia, and Martijn Wilder, a director and governor of WWF, stepped aboard. What care the council takes to ensure balanced representation on its board! By the way, Purves is a also governor of the Youth Climate Coalition, which council CEO Amanda McKenzie ran for four years. The other new directors were Samantha Mostyn, non-executive director of CO2-spewing Virgin Australia, and like Wilder, she’s a director of the NSW Climate Change Council (again, note the impressive diversity of interests!). The fourth newcomer is Matthew Honey of accountants EY, who’s in the business of climate-change consulting and greenhouse gas auditing. Question 3: Why no public announcement? As mentioned, the resignations were not a good look. Maybe the council decided that it was smarter to merely conform to the letter of the law, as per chair Hueston’s letter to Quadrant Online, i.e. disclosure only in the ASIC and Charities Commission data base. Question 4: Why no mention in the annual report for the public? See Q3 above. One assumes both paid councilors and certain paid staff are in the ‘key management’ category. The ‘key’ staff appear to be CEO Amanda and, maybe, Chief Operating Officer Katrina Porteus. The council’s other five staff don’t seem ‘key’. The council won’t comment on who’s ‘key’ and who isn’t. The $247,000 figure also needs annualizing. It’s only for nine months, and in the case of the paid councilors like Flannery et al, their pay involved less than three months. Annualised, the $247,000 would be at least $330,000, at a guess. The previous job of CEO Amanda, Monash Ll.B. Hons – (thesis: emissions trading) was “senior communications adviser” for the Climate Council, a job worth say, $80,000 pa (or $150,000pa in the Rudd/Gillard public service) and before that she was for four years national director of the Australian Youth Climate Coalition. It has, in Amanda’s words, “passionate, amazing” members [i.e. crazed young Myrmidons]. Let’s imagine her council pay involves a decent fraction of that $330,000. While the council waxes indignant about vested coal interests (not so much, BP fossil fuels), its own crowd-funding model means that unless the council keeps its climate scare-o-meter on perpetual maximum, donors lose interest and Amanda will be queueing at Centrelink. She’s doing her best – 15,000 placements of climate stories in the media, 100 million people cumulatively impacted in nine months. But 53% of Australians in the latest (2013) CSIRO survey didn’t believe “humans are causing climate change” , despite Amanda’s earlier missionary work at the Climate Commission. With the warming halt continuing, I imagine Amanda’s struggling for new converts. I guess donors like myself will have to endure the mushroom treatment. Question 6: Do the councilor types donate back to the council their earnings from the speaker circuit? In fact Tim Flannery as “one of a new breed of planetary heroes” has been king of Australia’s speaker circuit, commanding as much as USD50,000 for speeches predicting what’s going to happen in the year 2100, and how, by then, Gaia will have acquired a brain and nervous system to act as a living animal, as a living organism, at some sort of level. Claxton Speakers’ website has Flannery’s views for sale at rate “E”, meaning $A15,000-plus. 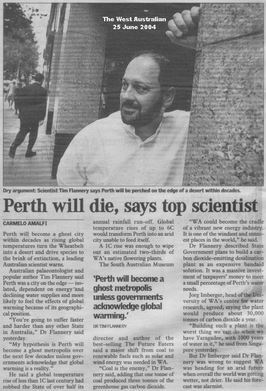 He can talk authoritatively not only on Gaia’s brain, but on how a waterless Perth will become this century’s first ghost metropolis, dams that won’t fill, and all that. Councillor pay 2013-14 = $247,000 minus X (key staff pay). Sadly, council won’t say what “X” is. If that isn’t a full-time project, even for Tim, what is? Can he maintain undiminished output at the council, despite this potentially Nobel-winning assignment at the peer-review-challenged Sustainable Society Institute? Could the 5.4m square kilometres of summer ice up there last September somehow throw her forecast into doubt? Answer: no response from Amanda. Arctic expert Professor Wieslaw Maslowski, 2007: My projection of an ice-free Arctic in 2013 “is already too conservative”. World-leading Arctic expert Professor Peter Wadhams, Cambridge, 2012: In what he calls a “global disaster” now unfolding in northern latitudes, with “terrible” implications, there will be a collapse to zero of the Arctic summer ice in 2015-16. “The final collapse towards that state is now happening and will probably be complete by those dates“. Wadhams has now slyly pushed back his icy-pole-apocalypse to 2020. Previous forecasts have been thrown where they belong, down the memory hole. Question 10: The council is controlled by its “Members” but who are these “Members”? They have one vote each at general meetings and they elect the directors, hence they are the ultimate power trippers in the council. Some “members” are those who established the Constitution and other “members” can be admitted subsequently at the complete discretion of the Board. There can’t be many members because a general meeting requires a quorum of 60% of the total membership. Alas, the council won’t even say how many Members it has, let alone who they are. I applied to the council to become a Member myself,[i] but within 24 hours the council advised me that “The Council board is not considering any new membership applications at this point in time.” That does hold out some hope. My goal as Member would be to make the council’s work more balanced and transparent by the appointment of eminent climate scientists Bill Kinninmonth and Bob Carter as directors. Wish me luck with the note below! I wish to apply to become a Member of the Council, as per the Constitution. 8.1.2 Every applicant for membership of the Company must apply in the form and manner determined by the Board. 8.1.4 After receipt of an application for membership, the Board must consider the application and determine whether to admit or reject the admission of the applicant. The Board need not give any reason for rejecting an application. As per 8.1.2., could you please supply me with appropriate protocols for my application? “The mission of the AYCC is to mobilise our generation to solve the climate crisis”: Ms McKenzie. Al Gore, 2007 in his Nobel Peace Prize speech: In the last few months, it has been harder and harder to misinterpret the signs that our world is spinning out of kilter. Major cities in North and South America, Asia and Australia are nearly out of water due to massive droughts and melting glaciers.” Since our massive droughts have ended and dams are ok, on Gore’s logic the world is presumably no longer spinning out of kilter. Flannery also said Sydney would “soon” run out of water. I’m not sure what the current storage capacity is today but I’ll be there’s water in that dam. These outrageous, over-the-top prognostications have robbed climate (so-called) science of its credibility and that’s what is likely to dry up long before the water evaporates or ice melts. Excuse my ignorance but don’t the financial reporting obligations for charities with income in excess of $1m require complete disclosure and aren’t they required to be audited? Note: the ATO considers crowdfunding to be income.